Someone posts a picture of a card (cigarette or, if they prefer, other). 1) to say something about it. This may be (if you're an expert) a card ID, (more broadly) an identification of the theme or person depicted, or (more openly) simply a comment of a more subjective kind - it might just be to say the card doesn't appeal to you personally. 2) to post the next image for someone else to respond to - which, if this works, will keep the chain going .... until it is eventually dropped for lack of interest! Well anyway, I'm going to propose this, and hope it's not a lead balloon from the start! 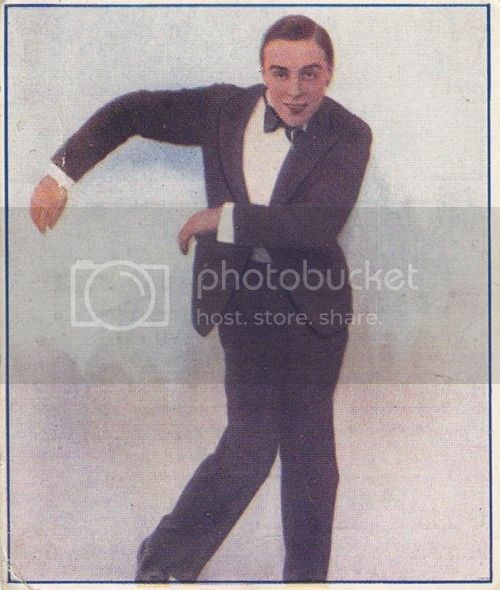 I believe the subject/image is Max Wall (comedian/actor) and the particular card is R & J Hill Music Hall Celebrities (issued 1930). A nice set of cards with some great facial expressions! I have read that John Cleese was influence by Wall on his Monty Python Ministry of Silly Walks sketch (don't know if actually true). Just an insert to say JK is right in every detail - including the bit about the inspiration for John Cleese. Billy Dainty was another who kept alive the "rubber-legged clown step" (for want of a better description) pioneered by Prof. Wallofski - though not the terrifying gurning. He also influenced Stanley Baxter and many others. But also Shakespeare and Beckett. All in all, Mr M Lorimer Jr. certainly had one of the most bizarrely versatile of all theatrical careers. Ooh - so you're turning it into a quiz! ~ Well, that's one way posters can go, if they choose. I'm only a prawn in this game (as Arfur Daley used to say), so I'll have to leave it to one of our experts. But the car looks very Edwardian - the age of EH Shepherd's illustrations for Wind in the Willows ("parp-parp", said Mr Toad in a daze). The problem is, the card could be from any time from then onwards. It looks "very vintage", so I'd guess 1912, 1914. The opulence before the catastrophe. I have even less idea of the series! Sports & Pastimes by Taddy, Teofani, and about 12 others! Is that because BAT was already starting to hoover up the smaller companies? So that it was able to put the same set out under different labels? Are you going to post us one up, jerome? Well, it doesn't seem to be from the Liebig "Folk/Popular Dances" set that appeared in various continental countries at that time. It appears to be card 2 from Haus Bergmann "VarietÃ© und Zirkus" except that's a set of 200 issued in 1934. Attached is the other side. My guess would be "Circus Scenes". It's interesting how the same pictures got used all over the place. Circus Scenes it is, not your average scene from a circus I've ever been to! Is this more your sort of circus? I've blocked out the name of the set which was printed on the front. Any guesses as to which one? All I can say is that "the supporting cast" looks scarily along the wannabee-Aryan lines of "Tomorrow Belongs to Me". Is the picture from early Nazi Germany? 1933-35? Of course, callisthenics and the like were not restricted to the land of Leni Riefenstahl in that era. But God forbid that British chaps and chapesses should get up to that sort of near-naked nature-worshipping mallarkey, or all that effort.